I just returned from visiting Jamaica last month and it was hot, hot, hot! 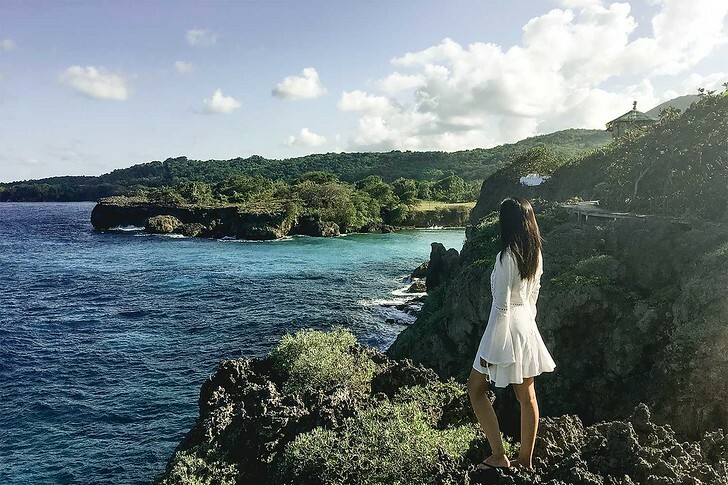 I visited Kingston and Port Antonio in 5 days, 4 nights on a relaxing getaway focused on beautiful natural sights like Frenchman’s Cove, the Blue Lagoon and the coffee-heavy Blue Mountains. You can read more about my trip itinerary and the top sights I recommend in this post, Rafting on the Rio Grande and Other Must Do Things in Portland, Jamaica. For short trips under a week, I like to pack with just a carry on. Whether you’re staying at an all-inclusive on Montego Bay or docking in Ocho Rios, read on for my Jamaica packing checklist! Day Clothes | I packed a mix of dresses and casual clothes but ended up mostly wearing sundresses over bikins. Jamaica is a very relaxed tropical environment and I only felt the need to slightly dress up during dinner times, when I swapped flip flops for closed toed shoes and shorts for pants. Other than that… relax away! Swimsuits | The obvious one and my choice for what to wear all day. Pack a couple suits for lounging around on the beach and water activities. Jamaica is blessed with beautiful waterfalls and rivers and Port Antonio in particular has the most serene lagoons I’ve ever seen! My go-to stores for bathing suits (both one pieces and bikinis) are Revolve, Nordstrom and Shopbop. They always carry the best range of colors and styles in every price range. I like to pack a mix of one piece swimsuits and bikinis that cover up but still have cut outs and color. Sunscreen | The sun is strong in Jamaica and I like to bring both a facial sunscreen and all over body sunscreen. For the face, this Japanese brand is my hands down favorite – it’s non greasy, affordable and non-tacky without any scent. For the body, I love this broad spectrum sunscreen which smells like coconuts and leaves your legs nice and glowy. Aloe Vera | I got pretty sunburn on our bamboo raft ride down the Rio Grande. It felt super leisurely (and I loved the floating beer raft) but I should have put on sunscreen beforehand! Aloe vera gel is the key to relieve any pain. I loved this organic version made from cold pressed aloe. Lip Balm with SPF | An absolute must have to avoid chapped lips! My favorite day balm is Burt’s Bees, and my heavy duty favorite is by French brand Aquaphor. Bug Spray | There are definitely mosquitoes and bugs around so protect yourself from any potential viruses by bringing along some bug spray in advance. Look for a high level of deet in order to be effective and just make sure to wash your hands with soap and water after applying. I use this spray if I’m in the woods or a forested area but for regular day time use, I’ve been loving these wrist bands. The bracelets contain a blend of insect repelling oil so you don’t have to apply bug spray directly on your skin. I usually get 2 – one for my wrist and one for the ankle otherwise the range of coverage doesn’t seem to extend across the full body. Snorkel Gear | If you love water sports and are thinking of snorkeling, pack your own. It’s much cheaper to buy an inexpensive set off Amazon than to rent… not to mention more sanitary. I got this inexpensive snorkel set off Amazon, which comes with its own waterproof bag for easy transport. Lightweight Beach Towel | Typically hotels will provide towels but I like to bring a small, light weight towel of my own just in case. This is my favorite as it’s made of microfiber and dries quickly – perfect for those times when you only stay overnight in a hotel. We did a couple tours on our trip and I’d highly recommend 2 in particular: a bamboo raft ride and Blue Lagoon day trip, and a hike up the Blue Mountains to learn about Jamaica’s famous coffee plantations. In the end, I decided to travel light and just go with a carry on. I’m currently using this hard shell CalPak carry on which wheels around easily and is quite compact. Inside there’s a zippered section on one half where I like to keep heavier items like shoes and toiletries and on the other side, I mainly keep clothes. This inexpensive 4 piece packing cube set has nearly 6,500 glowing reviews while several travel blogger friends swear by this set from eBags. Personally I use a set from CalPak which I love. They’re machine washable for easy cleaning and if you have CalPak luggage – they’re perfectly sized for their carry on luggage pieces! Travel Bottles | I use these bottles for shampoo and conditioner – you can use them to story anything, even skincare products. I also love this inexpensive yet stylish jewelry case to organize earrings, necklaces and any small items like bobby pins + hair ties! Camera | I bring a professional DSLR camera and a couple lenses to shoot all the photos you see on this blog. I also bring my spare battery, battery charger and extra SD cards. To keep everything organized, I use a memory card case and a travel accessories case so the wires, chargers and small things don’t get lost. For underwater photos, I use a GoPro, backdoor floatie and dome. For video, I use a stabilizer and my iphone, along with an external battery. You can find all my gear here. Read more: Here’s Where to Stay in Jamaica!